Katsuyuki Mito was born in 1978. He started playing the keys since the age of four, and at the age of 17, he got inspired by the falsetto voice of “September” by Earth Wind Fire, and started singing. Later while he worked at a music club, he went jamming with black singers, inspired by jazz, soul and gospel and his skill got improved. In 2004, he went to Tokyo and started singing on the street. 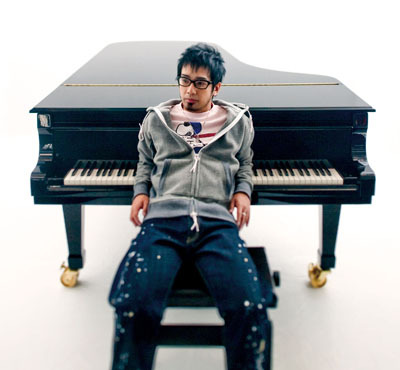 He released an indie CD titled “Natural Soul” in 2005, which drew attention in the scene. In 2007, he changed his artist name into his real name “Katsuyuki Mito” as a major label artist. The single “Kimi ga Areba” got pushed on 34 radio stations nationwide, and his pop writing skill and vocal ability was highly acclaimed. He is also so good at mixing other influence than his musical roots in a unique style that his cover of Kiseki Okina Ai no Yoni” was picked as the theme song of TBS TV drama “Ohukuro Sensei no Yubari Sinryo Nikki”, which became a ringtone hit. His covers are also another charm of his music. He is a multi-talented piano-soul guy to watch out with great performance ability and creativity.